Most oven roasted veggies are delicious, but eggplant in particular is one I never quite enjoyed. Don’t get me wrong, I love using eggplant in many dishes, but never really liked it plain, mainly due to it’s texture. Now if you tell me they have a light crispy exterior to them and taste like fries, I’m sold! I already have a few baked crispy veggies in the archives, but these new Baked Crispy Eggplant Rounds have become very popular and deserved a post all to themselves. 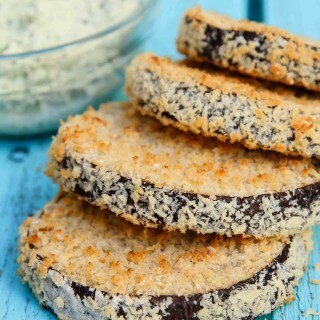 After I developed my Portobello Mushroom Fries, I have my favorite method for coating/breading to give that great airy, crispy exterior we all love. If you dip them in some vegan ranch or chipotle aioli, they become the perfect afternoon snack, school lunch side, or appetizer. Combine them with my garlic basil vegan ricotta and some marinara for some healthy eggplant stacks. There’s really not much else to say about these other than MAKE THEM! These Baked Crispy Eggplant Rounds are being featured in a new recipe coming to the blog next week, so be sure to check back! These Baked Crispy Eggplant Rounds are the perfect finger food, snack, or vegetable side to pair with dinner! Toss the eggplant rounds with some sea salt, and place in a colander over the sink for about 30 minutes. The salt will help remove moisture from the eggplant. Dry the eggplant rounds by patting with a paper napkin or towel to remove any moisture released. Add some of the breadcrumbs into a bowl for coating. Add more as needed after you start breading the eggplant rounds (the reason for starting out with the minimum needed is so if the breadcrumbs end up clump due to the batter then you may need to replace them entirely with fresh breadcrumbs). Dredge each eggplant round into the batter to coat thoroughly on both sides and then dip into the breadcrumbs on both sides and edges. Place the breaded eggplant rounds on the parchment lined baking sheet. Note: Keep the whisk handy so that you can quickly whisk the batter mixture when needed if you feel like the contents of the batter start to settle (this will probably happen after prepping 2-3 eggplant rounds). 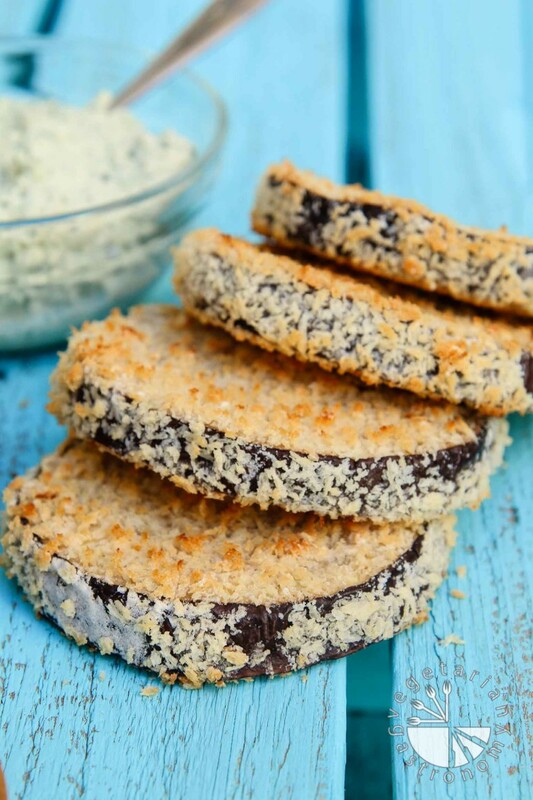 Once all the eggplant rounds are breaded and placed in a single layer on the baking sheet, sprinkle some sea salt and freshly ground black pepper, and bake them in the oven for a total of 20-25 minutes. Flip half way through so that they bake for 10-12 minutes on each side or until lightly golden brown and crispy on both sides. Enjoy them with a side of some vegan cucumber ranch or chipotle aioli . You can also combine them with my Garlic Basil Vegan Ricotta and your favorite marinara sauce for eggplant stacks. This looks delicious Anjali and I can almost hear the crispness.. Paired with any of those dips...I can only imagine! YUMMY!!!! I am sold with your pics. I love egg plant coated and in the oven, even those the texture is sometimes slimmy :-) THESE LOOKS SUPER DUPER! These aren't slimy at all so you will love them even more. I made sure of it, since that's exactly my main problem with oven roasted eggplant unless I use it in a recipe with other spices. Thank you! This looks great! What type of eggplant did you use? Italian or Chinese? I've tried a similar recipe but used Chinese eggplants. Thanks! I use the large Italian eggplants every time I make this recipe. I'm sure it'll work fine with Chinese eggplants as well, but I've never tried (mainly because I always get tempted to make my Thai Basil Eggplant if I have Chinese eggplants on hand). Hope that helps! Let me know if you try it out, and stay tuned to see what recipe I used these in next week!